Yogurt keeps chicken cutlets juicy and tender while crushed almonds stand in for traditional breading in this healthy low carb, gluten-free entrée. Paleo and diabetic-friendly. 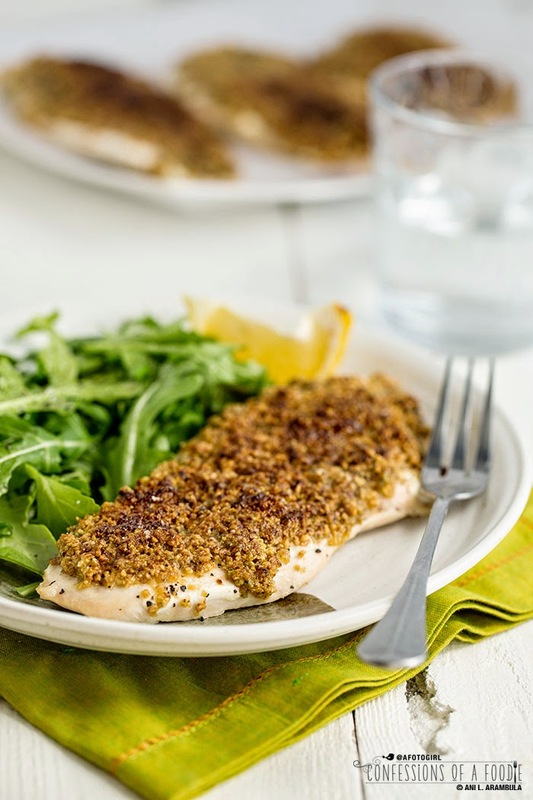 Yogurt keeps chicken cutlets juicy and tender while crushed almonds stand in for traditional breading in this low carb, gluten-free entrée sponsored by Straus Family Creamery. One of my fondest culinary memories from childhood is my mother’s fried chicken. I was mesmerized by her dipping, dredging, and frying. It was a choreographed mystery to me and how was it that it always came out so tender, juicy and flavorful? I’ve come close but I’ve yet to replicate it. Besides mom’s fried chicken, there were plenty of weekends of picking up a bucket of Kentucky Fried Chicken or Pioneer Chicken (remember Pioneer Chicken?) and heading to the San Diego River or Mission Bay for some fishing or an impromptu family picnic. Also, there were many nights Dad would come home from working second shift and quietly sweep into our bedrooms, waking us up by waving a bucket of fried chicken under our noses. Happily, all of us girls would rise, sleepy-eyed from slumber, trot out to the kitchen and take a seat at the table to have a snack while Dad ate his dinner. As a teenager entering the workforce, I’ll share here — I think for the first time — that my first job was at KFC. When I got the job, I was ecstatic. Fried chicken all the time. I even got to bring home leftovers on nights I closed, much to my family’s joy. Of course, a few months in, I was so very over having my hair, my clothes and everything I owned smelling like fried chicken and for the longest time after the job, I no longer had the taste for it. But like with most things in life, after enough distance from my teen years at KFC, my tastebuds once again craved good fried chicken. Due to it’s high caloric nature, eating it was often followed by guilt for indulging my craving. 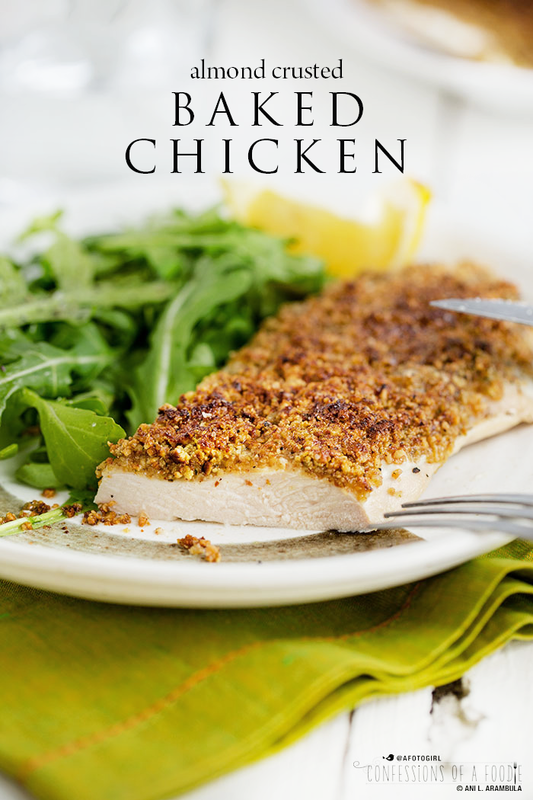 This low carb lifestyle of mine means coming up with alternatives for some of my favorite foods, like fried chicken, and this almond crusted chicken recipe fits the bill nicely. 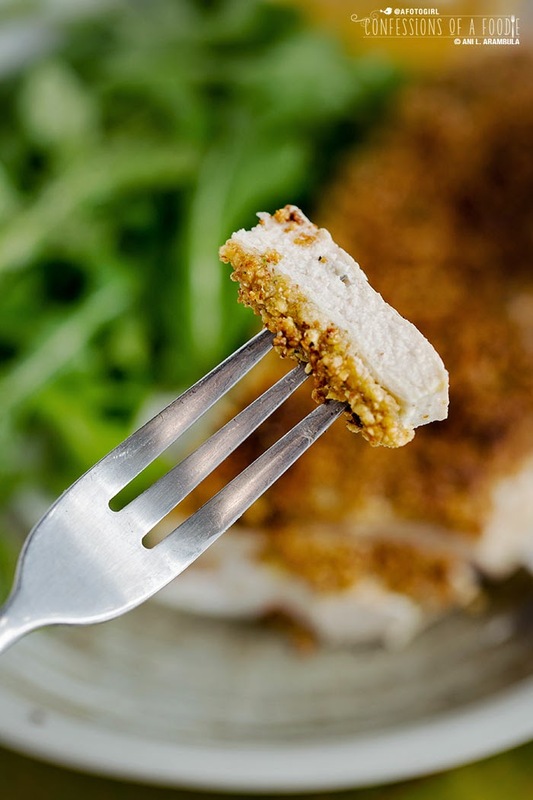 Tender cutlets of organic, non-GMO chicken are slathered in tangy Greek yogurt to keep them tender and juicy, then they are topped with an herbaceous almond crust. I’ve opted for baking in place of frying, upping the nutritional value while still satisfying my craving for “fried chicken." This dish is quick and easy enough for a midweek meal when time is especially short after a long day at work. In fact, I came up with this meal on a Monday night after stopping at the market for a chicken breast. It’s a good meal to stretch as well since the often oversized chicken breast is divided into three good-sized cutlets. 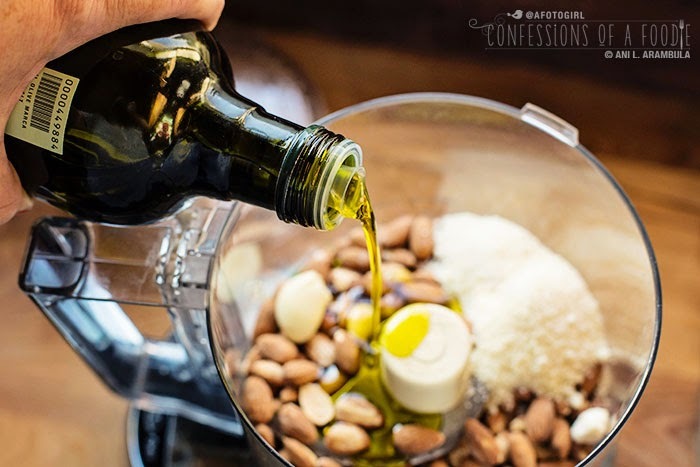 Use raw, unsalted almonds and good quality olive oil. Also, I highly recommend Straus Family Creamery Greek Yogurt. 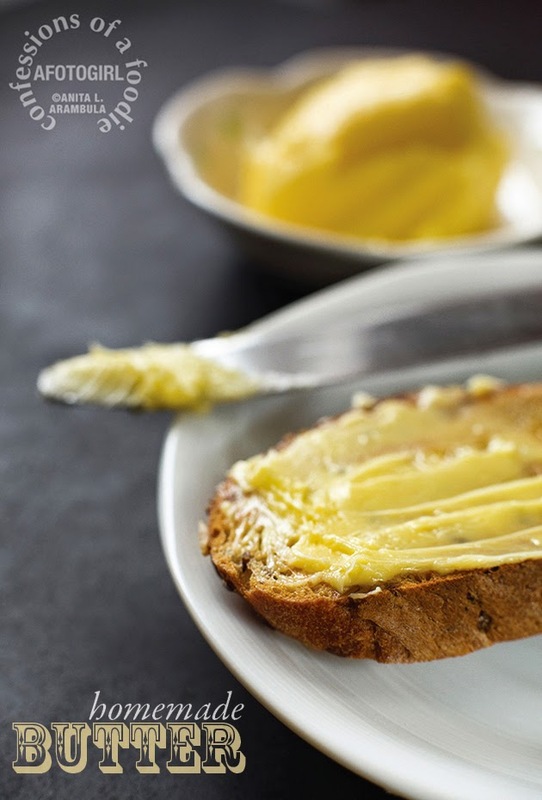 I’ve waxed on before about Straus even before getting my hands on promotional product as I discovered them a few years ago and have become a big fan of their cream-top milk and European butter. Recently, I stopped in at my local grocer only to discover that they were out of the brand of Greek yogurt I’d been buying. The only full fat yogurt they had on hand was Straus. I didn’t, at the time, know such a product existed. I brought it home and have been buying it ever since. Do you know about Straus? Have you seen it at your local market? I love their story which you can read more about on their website. But to summarize, the Northern California based Straus Family farm was the first certified organic dairy farm in the country back in 1994. Because there really weren’t many options for processing the milk their GMO free, pasture grazing cows were producing, they started their own creamery. Straus Family Creamery has grown from just milk to producing butter, yogurt, even ice cream and most recently, a low glycemic frozen dessert — all organic and GMO-free (in 2010, the Creamery was the first in the nation to be Non-GMO Project Certified)! They now have seven additional organic family farms supplying them with milk, helping to meet the demand for humanely farmed, organic dairy products. Also, all of their milk products come in environmentally friendly recyclable glass bottles which are super cute and harken back to the days before plastic and waxed cartons. Straus Greek yogurt is thick, creamy and totally delicious. 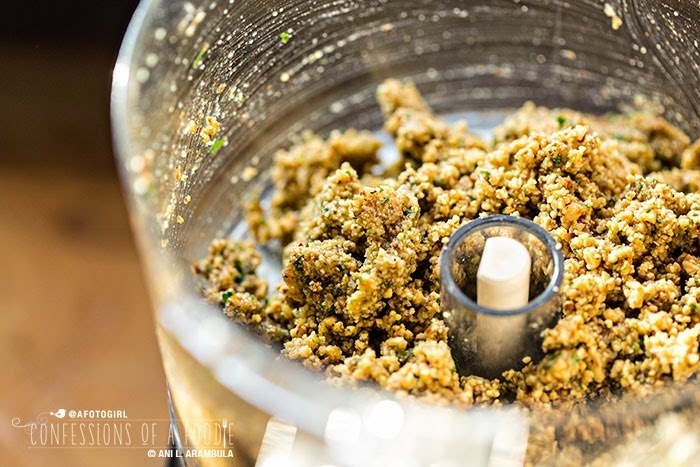 It’s the base for one of my favorite quick breakfasts (a cup of yogurt with berries, and rolled oats or slivered almonds) and I use it as a marinade, in salad dressings, and in my reduced sugar, low carb baking. So it was only natural that I would use it in this recipe to help tenderize the chicken. 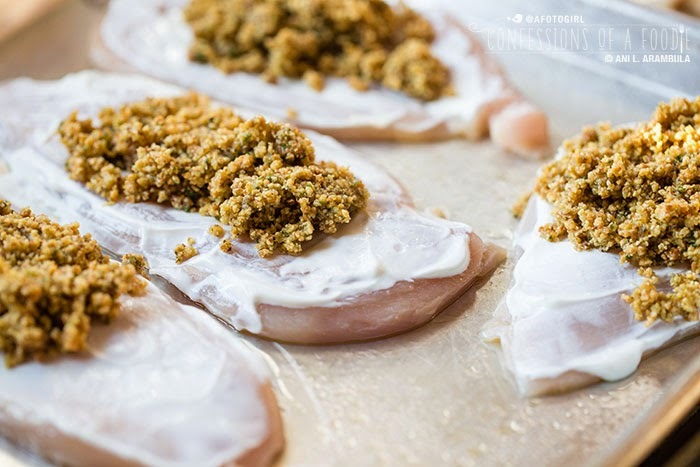 If you are great at planning ahead, cutting up the chicken the night before and bathing it in the greek yogurt to marinate overnight will produce an even more succulent piece of chicken when properly cooked. If you are more like me and don’t necessarily know what you’re going to want for dinner until it’s time to make dinner, then simply prepping the chicken first so that the yogurt has some time to work it’s magic while you gather and prep the rest of your ingredients and heat up the oven will still produce a really tasty bite of tender chicken. If you already know how to butterfly chicken, scroll past this quick step-by-step for the recipe. Until next time friends, be well. Butterflying chicken breast is a useful way of speeding up the cooking process by creating a more uniform piece of meat. Traditionally, the knife is kept parallel to the board, then you slice through the chicken, leaving the last ¼ of the chicken in tact. Then you "open up" the chicken to reveal a butterfly shape. The average whole chicken breast can weigh one pound – that's a hefty portion! 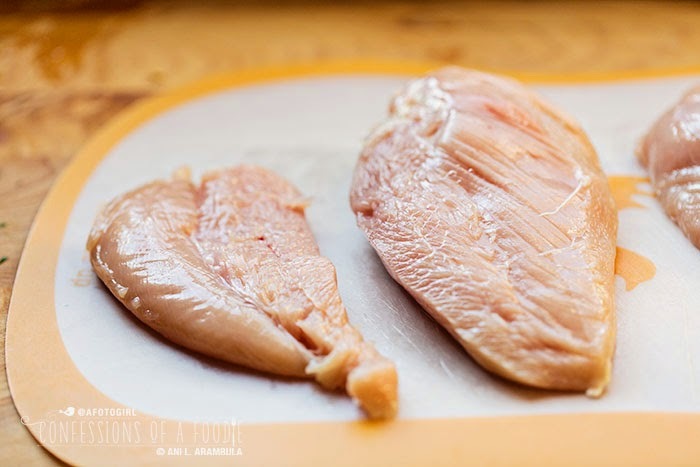 Here, first remove the tender, then we slice all the way through to create cutlets that we will then paillard (pound) the chicken with the flat side of a meat tenderizer to create an thinner (bout ¼-inch thick) piece of meat that will cook in a flash. First, remove the tender from the backside of the chicken by carefully slicing it away to create the first cutlet from the breast. 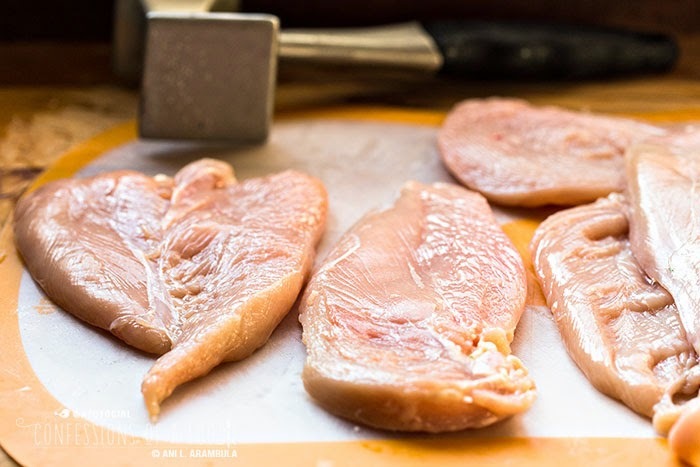 Place your non-dominant hand on the chicken, then keeping the knife parallel to the chopping board, start at the thickest end of the chicken and slide the knife in a smooth downward motion towards the bottom tip of the breast. Remove the knife, slide it back to the top between the freshly made cuts and slice again slowly towards the bottom, each time guiding the knife inwards. Place plastic film loosely over a cutlet and use the smooth side of a meat tenderizer to pound out the chicken to an even thickness. Repeat with remaining cutlets. My favorite kitchen helper these days is my Misto. You’ll need it — or whatever cooking spray you have on hand — for this dish. I fill my Misto with good quality olive oil in place of using Pam which leaves pans with a gummy residue (makes one wonder what it does to the human body … just sayin'). 1. If the breasts have a tender partially attached to the chicken from where the breast bone was removed, carefully slice it off being generous with the slice and set aside. We’ll pound this out and it will become a cutlet as well. 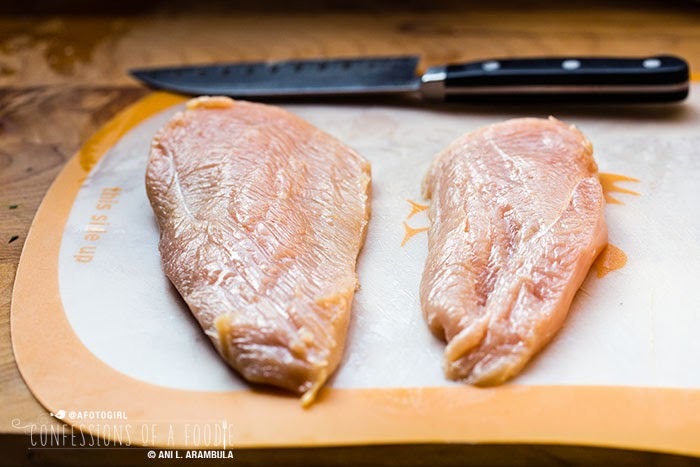 Place your non-dominant hand on the chicken, beginning at the thickest part of the breast with the knife parallel to the the chopping board, carefully slice through the chicken breast lengthwise to create a butterfly effect. Continue slicing all the way through to create two cutlets rather than one big butterflied piece of chicken (the smaller cutlets are a healthier sized serving). Repeat with second chicken breast. You should have six cutlets. Place a cutlet on the chopping board and cover with plastic film. Pound the cutlet out with the flat side of a meat tenderizer (or rolling pin) until the chicken is of even thickness. Repeat with remaining cutlets, pounding out each one to about 3/8 to 1/2-inch thickness to insure quick and even cooking. 2. Pre-heat the oven to 400 degrees Fahrenheit. Generously spray a rimmed baking sheet with olive oil cooking spray. Arrange the six cutlets on the pan. Place 1 teaspoon of yogurt on the center of each cutlet. 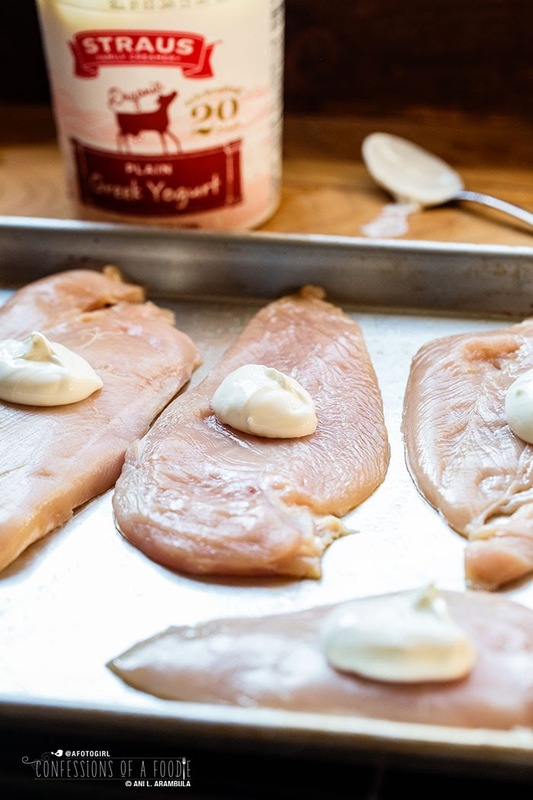 Using the back of the spoon, spread and massage the yogurt across the surface of each cutlet; set aside. 3. 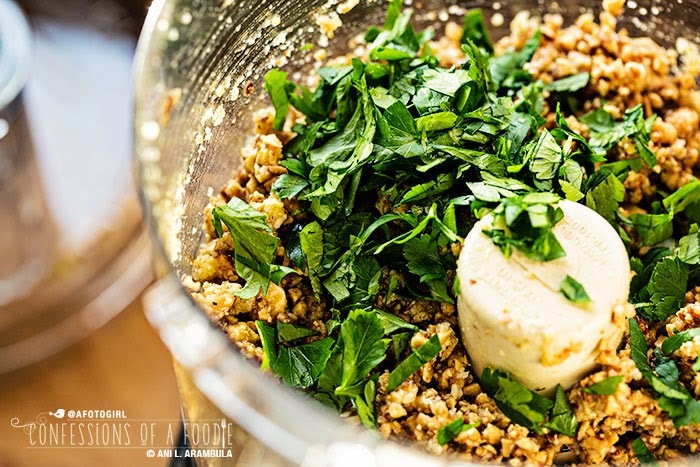 Toss the almonds, garlic, cheese, parsley, and ½ teaspoon each of salt and pepper into the bowl of a food processor fitted with the chopping blade. Drizzle in one tablespoon of olive oil and pulse until the almonds are a coarse meal (like coarse coffee grounds), stopping to scrape down the sides bowl as needed. Be careful not to over-process or you’ll wind up with almond butter. Divide the mixture between the cutlets and using slightly oiled hands, spread and pack down the almond crust evenly across the tops of the cutlets. 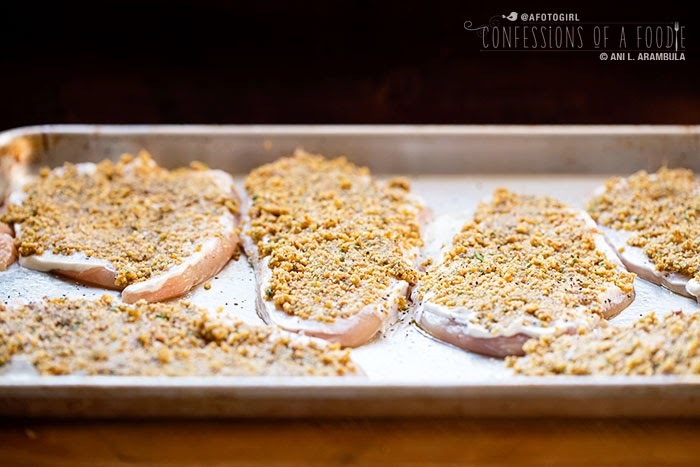 Sprinkle additional kosher salt and black pepper over the chicken then generously spray the cutlets with olive oil and place the pan on middle rack of the oven. Bake for 9 minutes, rotating the pan halfway through baking time. Turn off the oven and turn the broiler on to high. Broil the chicken for 2 to 3 minutes or until golden brown and just beginning to caramelize. Remove from oven and allow to rest in the pan for five minutes before serving. Disclosure: Straus Family Creamery provided me with coupons for free products in order to develop this recipe. No other compensation was given. 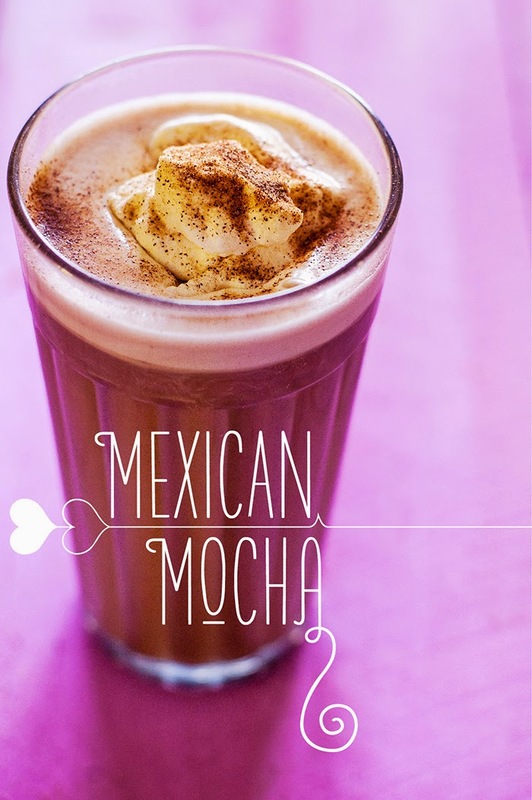 As always, recipe and opinions expressed in this post are completely my own. I accepted this assignment because Straus products are actual products I have been using in my own kitchen for years and highly recommend. oh my goodness! i've never prepared chicken this way! looks delish, Ani! !